Do you shy away from cooking fish because it always seems to come out dry. Have you ruined a pricey salmon filet because you just didn’t know when it was done? 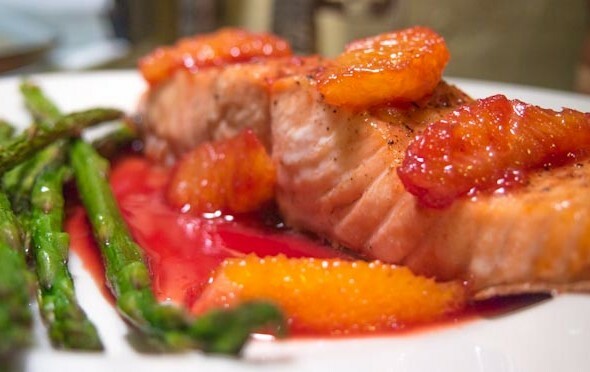 My Pom-Citrus Salmon will demystify salmon forever. The secret is marrying the size of the cut with the proper roasting temperature, the perfect amount of time, and a fool-proof way to make sure you end up with that perfectly cooked, creamy texture that brings out the best in this heart-healthy and delicious fish! The magic combination is a 6oz portion (at least 1 inch thick) roasted at 400° for 8-10 minutes to 120°-125°. The result is perfectly cooked, creamy salmon every time! ACK – you may have noticed this week’s post comes after a bit of a delay. I’m in the process of updating the flow of information here at My Tiny Kitchen, and since I’m a one-man-band, the technical learning curve can be a surprise. Plus I’m an actor, and actors’ lives can take bizarre turns with a single phone call that changes and supersedes all but the core essentials of our daily lives. I had not one but two such phone calls in the time since my last post, and in the topsy-turvy aftermath, this post is only making its way to you now. Put a metal baking sheet in the oven and set it to 400° to preheat for a full 10 minutes. 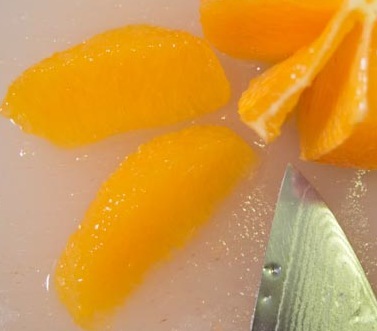 With a knife, peel and supreme (cut out the segments of flesh leaving behind the membranes and seeds-it’s a little bit of tedium, but it makes a huge difference). 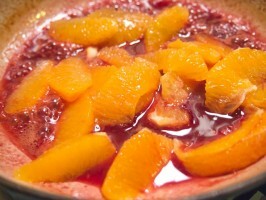 Into a separate container fromt the segments, squeeze the membranes to extract the remaining juice. Cut the top and bottom off the fruit. 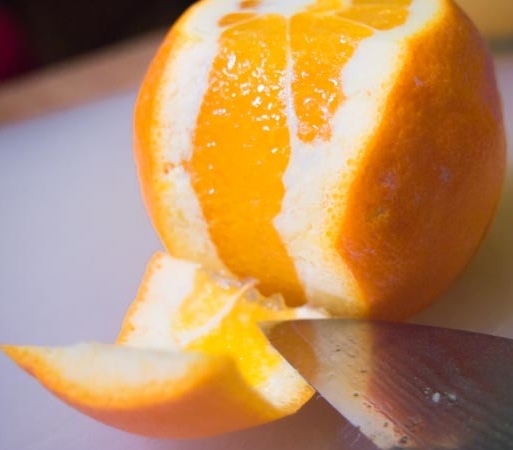 Peel the rind completely with downward slices. 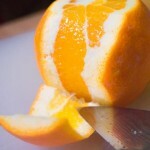 Separate the fruit flesh by slicing just on either side of the membranes. 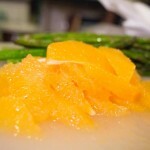 The wedges of fruit pop right out leaving behind a flabby ball of pith and … Wha-LA! The Supremes (of orange)! 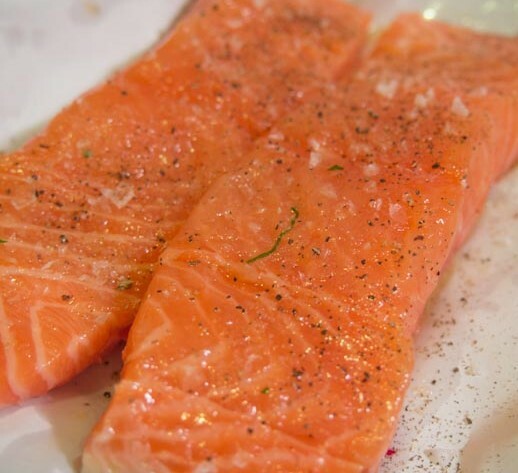 Drizzle the salmon filets with the olive oil and rub to coat on all sides. Season liberally with a flaky sea salt, like Maldon, and freshly ground black pepper. Slice the scallion on a diagonal to make pretty ovals (which are also easier to capture with a fork, so it’s practical, too). In a small sauce pan, combine the orange juice, grapefruit juice and pomegranate juice with a pinch of kosher salt. Bring to a boil and reduce by a little more than half, about 10 minutes (you should have a little more than cup of reduced liquid). Take the sauce off the heat while you check on the salmon. Check the temperature of one of the filets. You should be just around 120°. If you are under, roast the filets for 1 more minute. If you are at or over 120°, take them out. You’re looking for 120° to 125° – this temperature will give you fully cooked and incredibly creamy salmon. (No flaky and dry salmon here!) Tent them with foil (important step for that creamy texture) while you finish the sauce and platter or plate your side dish. 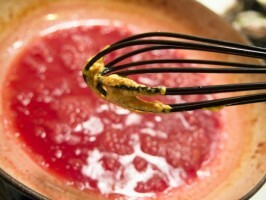 To finish the sauce, whisk in the mustard and the butter. 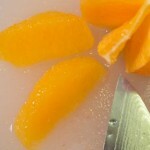 When they are incorporated, add the orange segments. 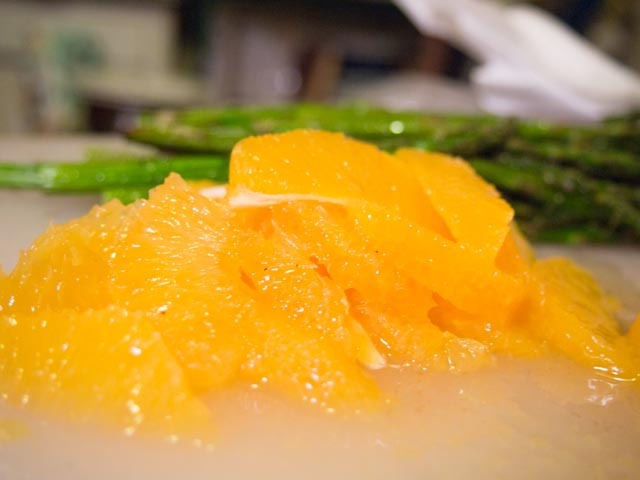 Let the hot liquid heat the orange segments through (no need to turn the burner back on), stirring very gently to coat the orange with the sauce. Spoon the sauce over the salmon on your serving platter or plates and sprinkle with the scallions. Serve alongside something yummy and green—roasted asparagus, green beans or a nice salad. Looks great! Can't wait to try it…….